"An easy and quick recipe for when tomatoes are abundant from your garden." Preheat oven to 350 degrees F (175 degrees C). Grease an 11x7 inch baking dish. Place bacon in a large, deep skillet. Cook over medium high heat until evenly brown. Drain, crumble and set aside. While bacon is cooking, wash tomatoes and slice off stem ends. Gently scoop out pulp, leaving a 1/2 inch wall. Finely chop pulp and place 1/3 cup of it in a medium bowl. You may discard remaining pulp. Stir crumbled bacon, green pepper, cheese, croutons, and salt and pepper into tomato pulp. Spoon an equal amount of mixture into each hollowed out tomato. 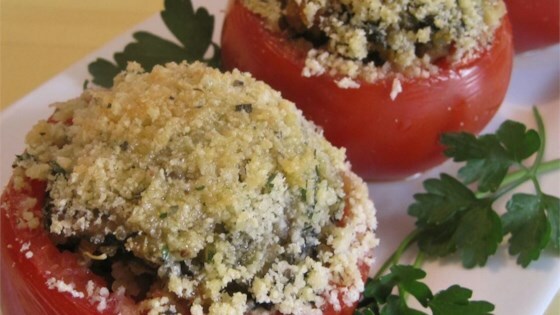 Place stuffed tomatoes into prepared baking dish. Bake in preheated oven for 20 to 25 minutes, until heated through. Garnish with parsley sprigs. I overall liked this recipe, although it needs a bit more flavor. Instead of bacon I used turkey sausage, and also added onions. Will make it again!